European leaders have been meeting in Brussels to try to find common ground on the migrant crisis ahead of a full EU summit this week. Italy wants all European Union countries to accept their share of the burden, or get less EU money. Sunday's meeting was called by German Chancellor Angela Merkel, who is facing a backlash within her own coalition. ''Wherever possible we want European solutions,'' Merkel said. ''Where this is not possible we want to bring together those who are willing and find a common framework for action." The Italian Prime Minister Giuseppe Conte said he was pleased with the outcome. The fate of a migrant ship refused entry by Italy exposed the deep divisions on the issue in Europe. 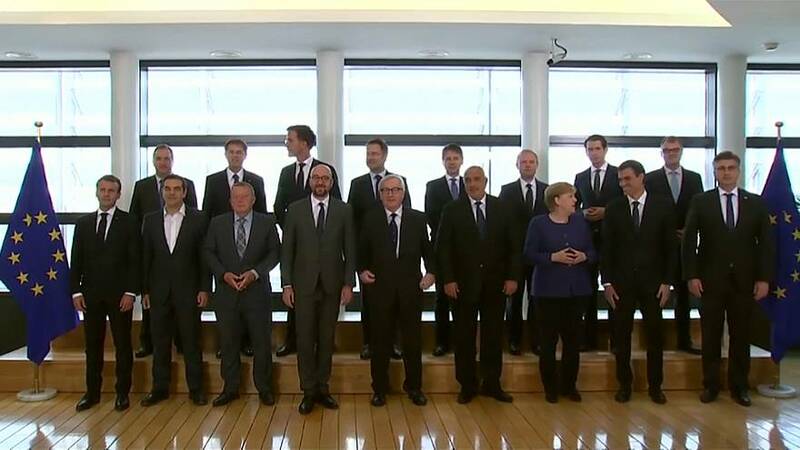 The meeting was attended by the leaders of countries on the frontline of the crisis - such as Italy, Spain and Greece - but was boycotted by others, including Hungary and Slovakia. What was on the tablet that had May and Merkel laughing?